At around sunset on February 28, 1963, a cloud appeared in the vicinity of Flagstaff, AZ and remained sunlit for 28 minutes after sunset. It was highlighted in the May 1963 edition of Life Magazine. 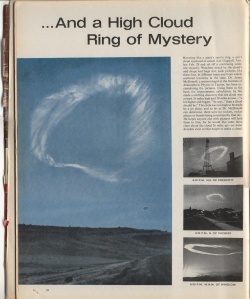 In addition to Life Magazine, various articles written appeared in Science Magazine (April 19, 1963), an independent report issued May 31, 1963, and in Weatherwise Magazine (June 1963). Believers of William Branham's message view the cloud as part of the fulfillment of a vision that William Branham had in December 1962 that Seven Angels would meet him outside of Tuscon, Arizona (see Prophecy of the Cloud). They see it as a supernatural sign that preceded William Branham's opening of the Seven Seals. Critics view the cloud as simply being the aftermath of the intentional destruction of a Thor rocket over Vandenburg air force base. They also view William Branham's stories about the cloud being the aftermath of the angelic visitation as untruthful, as these stories are in direct contravention with the facts. They believe that William Branham's own testimony clearly show that he made up the stories about being at the cloud's genesis and that these stories only began after he saw the article in Life Magazine. 1 The Big Question: Is William Branham Credible? The Big Question: Is William Branham Credible? Are you surprised that you haven't noticed these quotes earlier? It appears that even Billy Paul Branham was confused by all of this, believing himself that his dad was hunting below the cloud when it appeared. Here is what Billy Paul said in the preface to the book, The Revelation of the Seven Seals. This page was last edited on 18 January 2017, at 17:20.